The 1960s were a time of a fundamental watershed in Slovak literature with debuting authors switching from the thematisation of outer social reality to the convincing portrayal, mainly in shorter prose, of human intimacy. This is apparent from the very titles of the early books of Ján Johanides, Súkromie (Privacy, 1963), Rudolf Sloboda, Narcis (Narcissus, 1965) and Peter Jaroš, Popoludnie na terase (An Afternoon on the Terrace, 1963). In these first fruits, the commonly idealised hero of the world of work from the 1950s changes into an individual seeking his or her place in life and hence also in society, at the cost of making frequent errors. For example Urban Chromý, the protagonist of Sloboda’s debut work, Narcis, quits university studies to work in the mine but is repulsed by physical work. Chromý has a conflicting, at times hateful relationship with his girlfriend Dana. Also conflicting are his contemplations of God – from atheism to religious belief, etc. Troubled outsider characters are also found in Sloboda’s novels Britva (The Razor, 1967) and Šedé ruže (Grey Roses, 1969). Sloboda’s protagonist not only compensates for the triviality of the plot with his extraordinary vision of reality, but also becomes a vehicle for strangeness owing to his sharp intellect and complicated, perpetually unsatisfied nature which is not determined solely by social circumstances. In his texts Sloboda mixes the high and the low, questions of existence are blended with existential problems, bodily motifs intermesh with reflection and mystification is coupled with an autobiographic quality. In the same way the protagonists of Ján Johanides, in his later works Podstata kameňolomu (The Essence of the Stone Pit, 1965) and Nie (No, 1966), suffer from feelings of alienation and emptiness, which may be interpreted as the influence of existentialism. Later Johanides’s texts demonstrate the author’s ability to ‘de-tabooise’ the inner world of man and to see his dark passions, and often also the family curse. A disposition to the tragic alongside the grotesque may also be seen in Balada o vkladnej knižke (The Ballad of a Passbook, 1979) and in Najsmutnejšia oravská balada (The Saddest Orava Ballad, 1988). Experimental elements may also be found in Ladislav Ballek’s debut Útek na zelenú lúku (Flight to the Green Meadow, 1967), the influence of the nouveau roman can be traced in narratives by Peter Jaroš in the novel Zdesenie (Consternation, 1965), the novella Váhy (Scales, 1966) and the bi-novella Putovanie k nehybnosti (Journey into Numbness, 1967). However, the formal innovation of these debut works by the afore-mentioned authors is motivated by the transformation of the character, the efforts of prose writers to see man from all perspectives – in everyday problems and conflicting social relations. In the context of the 1960s we must also mention Alfonz Bednár’s novel Hromový zub (The Thunderous Tooth, 1964), a complex, multi-layered saga of several families comprehensively thematising the post-upheaval village with its contradictions between the individual and the community, the old and the new, hard work and proprietorship etc. Though Bednár finished the sequel to the novel Deravý dukát (The Punctured Ducat) in the second half of the 1960s, it could only be published as late as in 1992, subtitled Role III-IV, jointly with Hromový zub (subtitled Role I-II). 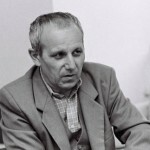 Vlado Bednár presented a humorous and satirical generational voice (of a young man) in his books Uhni z cesty (Get Out of the Way, 1964), Divné hrušky s divnou chuťou (Strange Pears with Strange Flavour, 1966) and Veterné mlyny (Wind Mills, 1967). Dušan Kužel’s debut Vráti sa niekto iný (Someone Else Will Return, 1964) is also an account of a young man, though his posthumously-published novel Lampa (The Lamp, 1991) is rather more convincing. A different voice in the 1960s was presented by Vincent Šikula, who in his books Na koncertoch sa netlieska (You are Not Supposed to Clap at Concerts) and Možno si postavím bungalow (I May Build Myself a Bungalow), both printed in 1964, revived the joy of elementary narration and the child’s pure perception of the world. 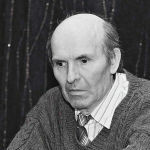 His novella S Rozarkou (With Rozarka, 1966) is a suggestive story of a mentally disabled girl, of empathy and humanity drawn through the care of her brother. Here Šikula explores complex life situations in a lyrical way while also exploiting folkloric (balladic) techniques. In his subsequent prose Nebýva na každom vŕšku hostinec (There is Not an Inn on Every Hillock, 1966) he was again drawn to the differentness of people from the periphery. Besides V Šikula, other emerging authors also attempted a ‘healthy differentiation of the young Slovak prose’ (Števček, 1986, p 69) during this period. Noteworthy examples include Ján Papp with his debut Kára plná bolesti (The Cart Full of Pain, 1969), Ján Lenčo with his book Cesta na morské dno (Journey to the Seabed, 1966), Ján Beňo with his short stories Každý deň narodeniny (Every Day a Birthday, 1964), Peter Kováčik with his debut Portréty (Portraits, 1964) and Belo Kapolka with his alpine stories Kanadské smreky (Canadian Spruces, 1967).